VFW Post Remembers Kazuo Masuda at OC ceremony. Masao Masuda, brother of Staff Sgt. Kazuo Masuda, made a floral presentation. WESTMINSTER — The story of the Nisei soldiers of World War II — and of one soldier in particular — was told during Kazuo Masuda Memorial VFW Post 3670’s annual Memorial Day service at Westminster Memorial Park. Staff Sgt. 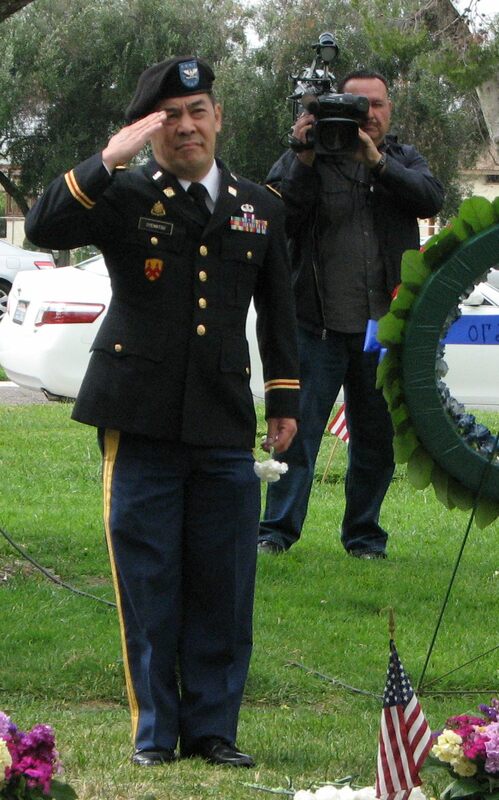 Kazuo Masuda, who is buried at the Westminster cemetery, was killed in action in Italy while serving with the 442nd Regimental Combat Team in 1944 and was posthumously awarded the Distinguished Service Cross. His family was represented at the program. Redondo Union HS Marine Corps Jr. ROTC posted and retired the colors and conducted a 21-gun salute. Nori Uyematsu led the Pledge of Allegiance and Lauren Kinkade sang the national anthem. Dennis Masuda gave a brief biography of his uncle, “a man I never met but I know well.” Born on Nov. 30, 1918 in Westminster, one of 11 children of Gensuke and Tamae Masuda, Kazuo Masuda graduated from Fountain Valley Elementary School and Huntington Beach Union High School, where he was a four-sport athlete (track, swimming, football and basketball). Dennis Masuda, Kazuo Masuda’s nephew, and David Ono of ABC 7 were the main speaker. The war was not yet over for the family, as Masuda’s brother Takashi was still in Italy and his brother Mas was in the Military Intelligence Service, getting read for the invasion of Japan. A large portrait of Kazuo Masuda was displayed during the program. 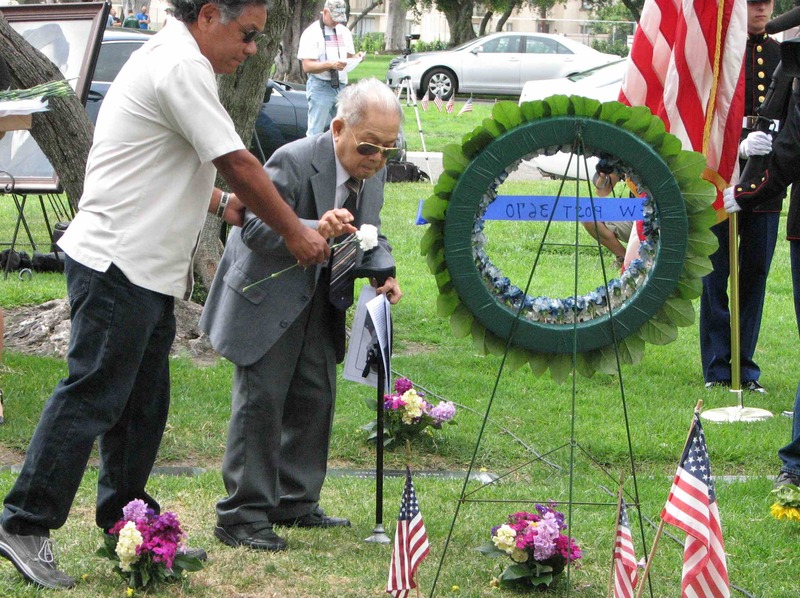 Col. David Uyematsu represented Japanese American veterans of the Gulf Wars. 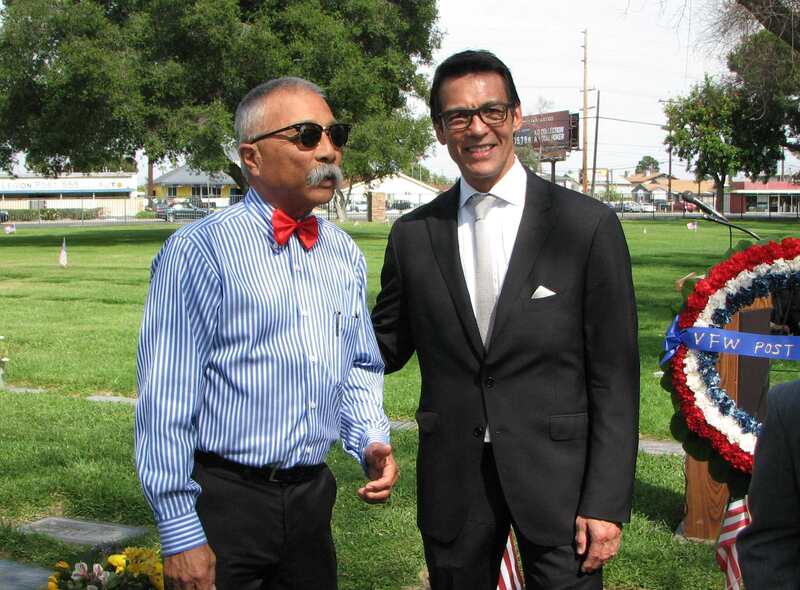 ABC 7 news anchor David Ono, who has produced documentaries about Nisei veterans and the internment, noted that there was tremendous public support for Memorial Day after World War I and World War II. “A million people would show up to a parade because at that time people understood what it meant to have a country in jeopardy, when we truly did not know the outcome of whether we would survive the war or not. So the men who went overseas and fought for this country, we truly appreciated what they did. The issue is personal for Ono because he grew up in a military family and his father served in Vietnam. He remembered his mother watching TV coverage of the war and worrying about his father’s well-being. 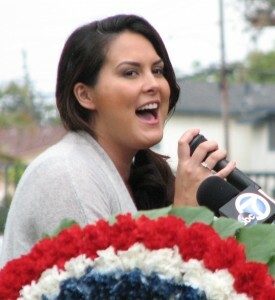 Lauren Kinkade sang the national anthem. “Coming to Los Angeles, I had this tremendous opportunity to meet members of the 100th/442nd/MIS, these wonderful heroes,” he said, “and to do their story over and over again, not just for the news but for other entities as well. Floral tributes were presented by Kazuo Masuda’s brother Masao on behalf of the family and by representatives of 20 veterans and community organizations. Ono and Kincade read the names of 104 post members who have passed away. 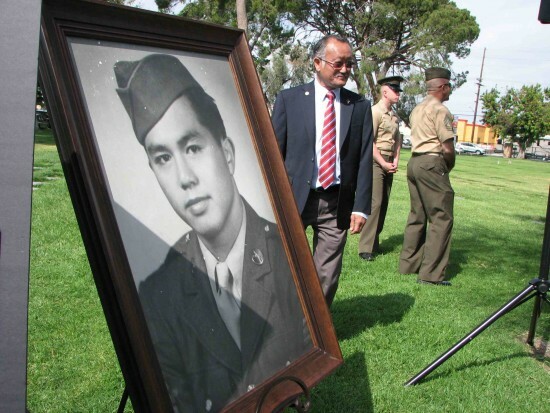 A display featured a large photo of Masuda and attendees were given literature about the Masuda family story and the Nisei Veterans Network’s upcoming Congressional Gold Medal digital exhibition, which will feature soldiers like Masuda, Takejiro Higa (MIS) and Daniel Inouye (442nd). So-Phis provided refreshments and some participants gathered afterwards at Furiwa Chinese Seafood Restaurant in Garden Grove. 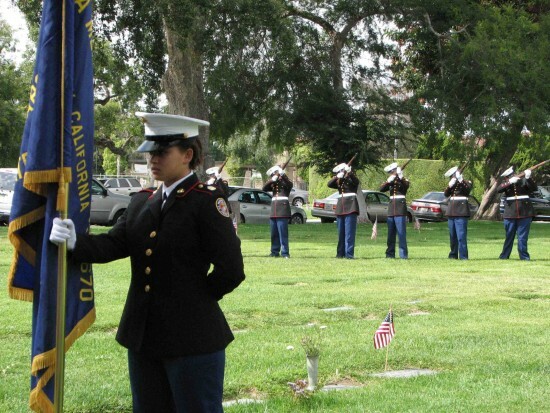 Redondo Beach Union High School Marine Corps Jr. ROTC opened and closed the ceremony.